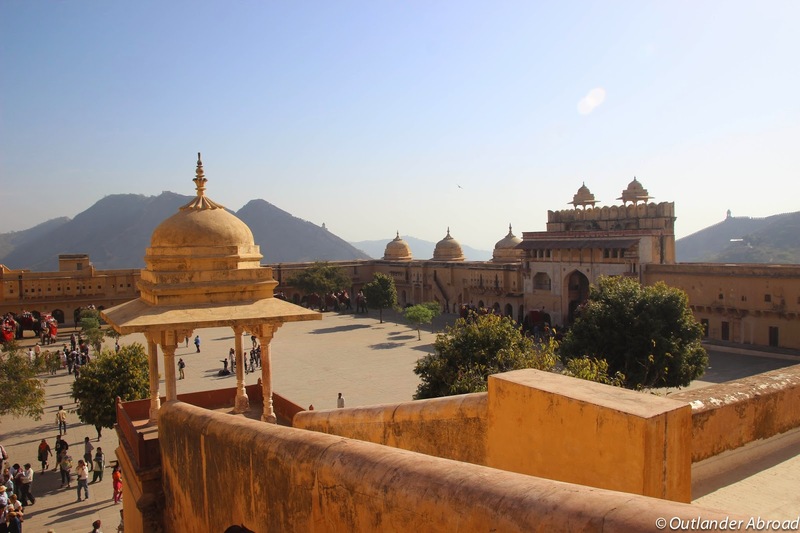 We packed a lot of sightseeing into our brief time in Jaipur. 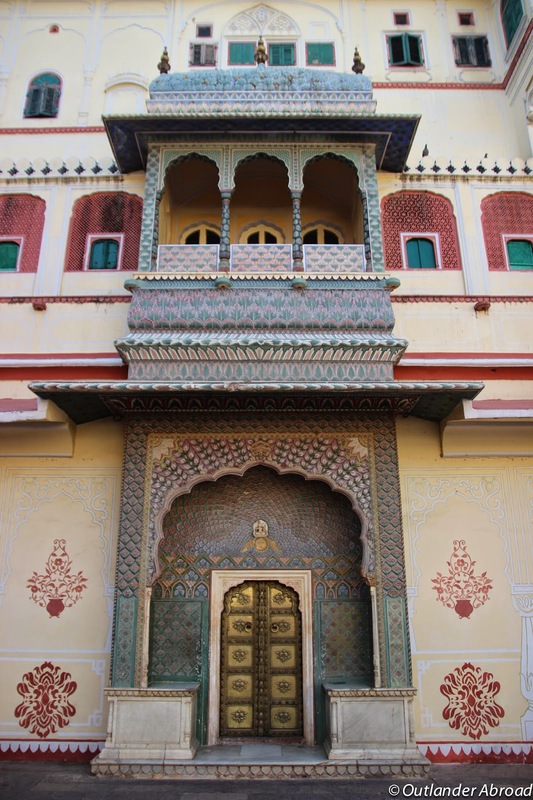 We stayed at a heritage hotel, the Mahal Khandela, a gorgeous colonial home, well-furnished with patios that wrapped around an interior courtyard. 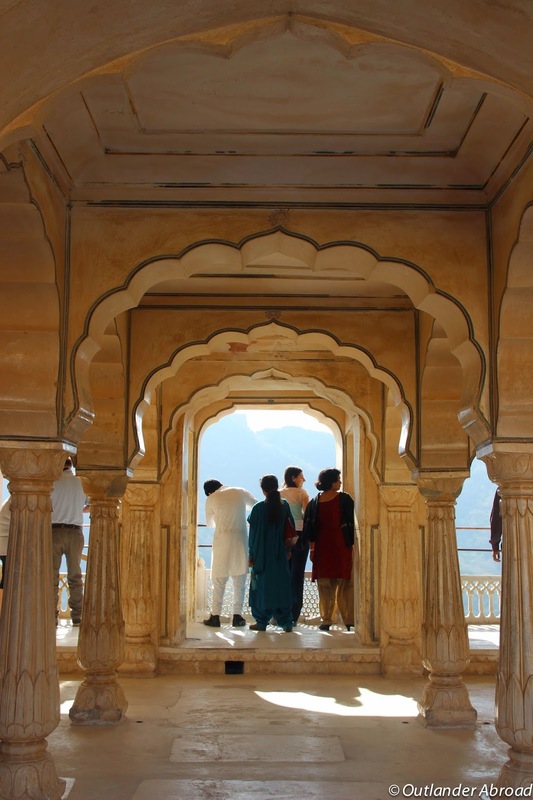 After a late arrival from Agra, we woke up early to swing by the Palace of the Winds for this stunning view of the unique architecture in the morning light. 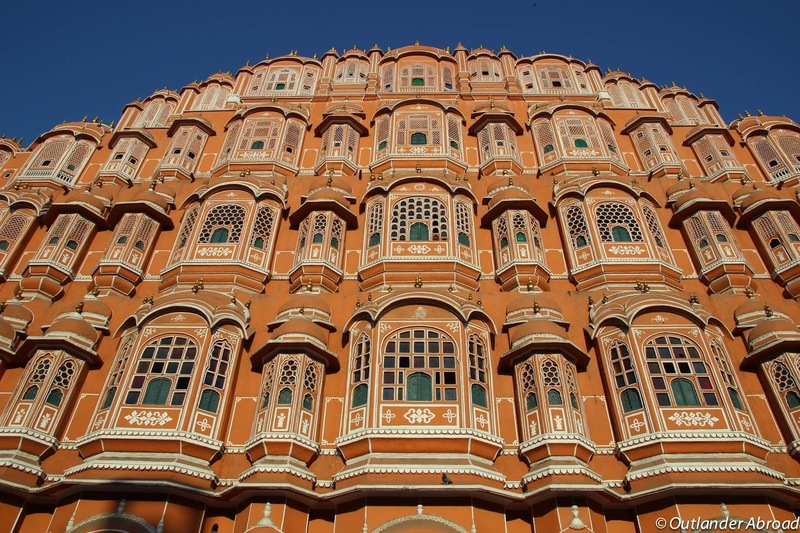 Most of the buildings in the interior section of Jaipur are the same light coral color, earning it the nickname the "pink city". 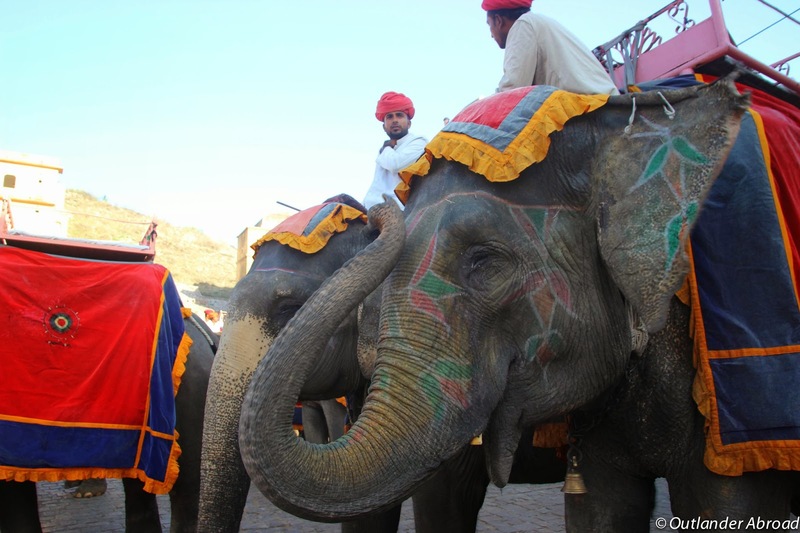 While the Elephant Festival we had been promised was cancelled for the year, we were able to take a ride to the entrance of the Amber Fort on the backs of these beautiful creatures, who were decorated in bright colors and patterns for Holi. 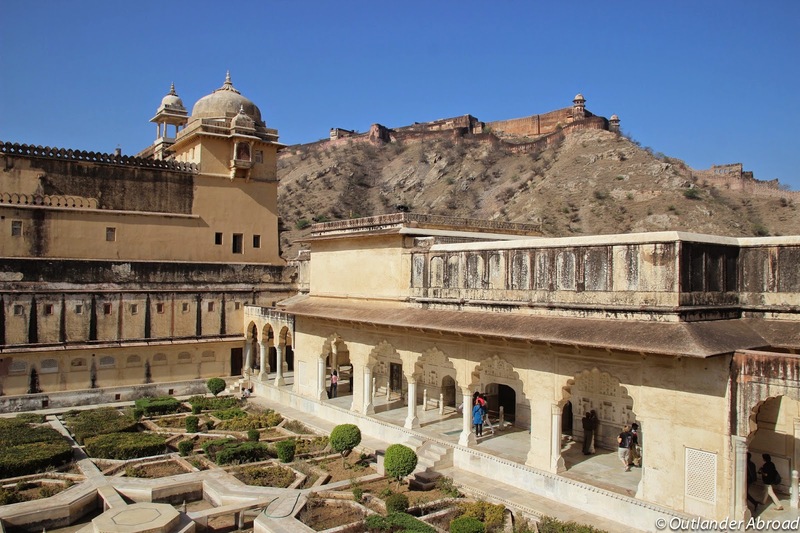 The Amber Fort was one of my favorite places on the entire tour - between the architecture, the beautiful light, and the opportunity we had to simply explore the expansive grounds on our own. 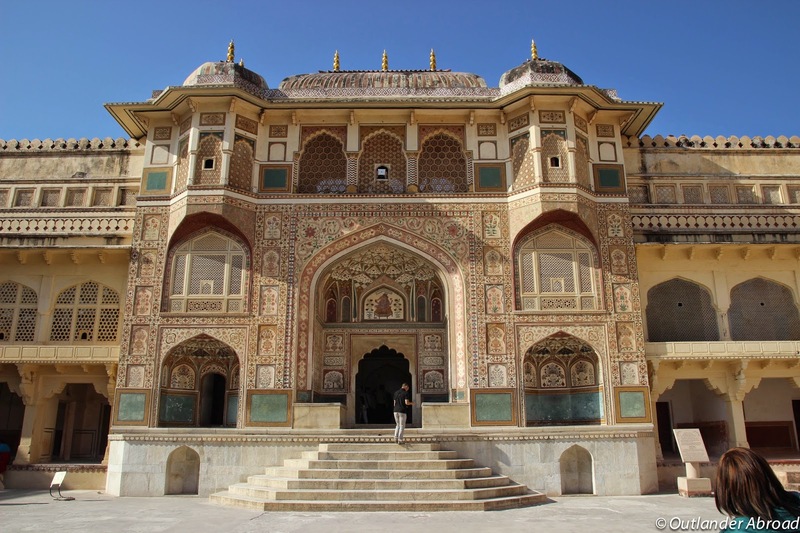 The facade of the entryway was beautifully decorated with colorful paintings of Ganesh, flowers, and organic designs, and the windows above were covered with geometric latticework, which allowed the women of the fort to see out without being viewed from the outside. 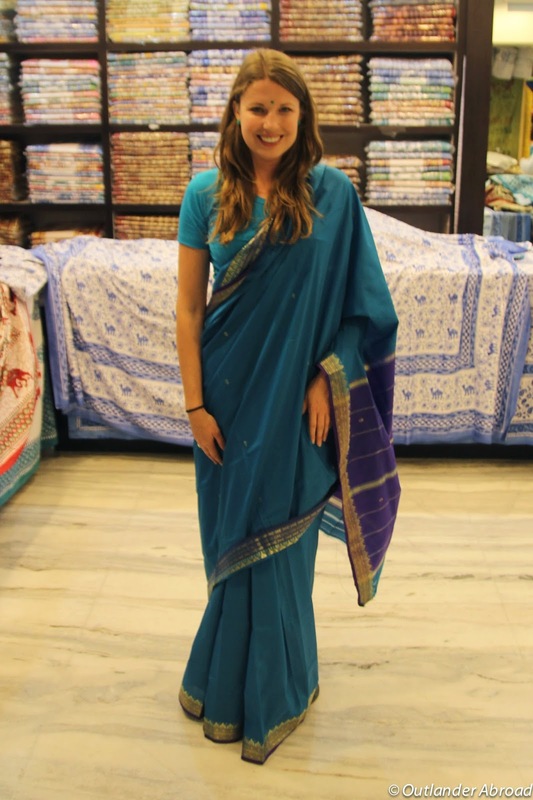 After departing the fort, we visited a rug and textile shop, allowing our tour group the opportunity for some shopping. 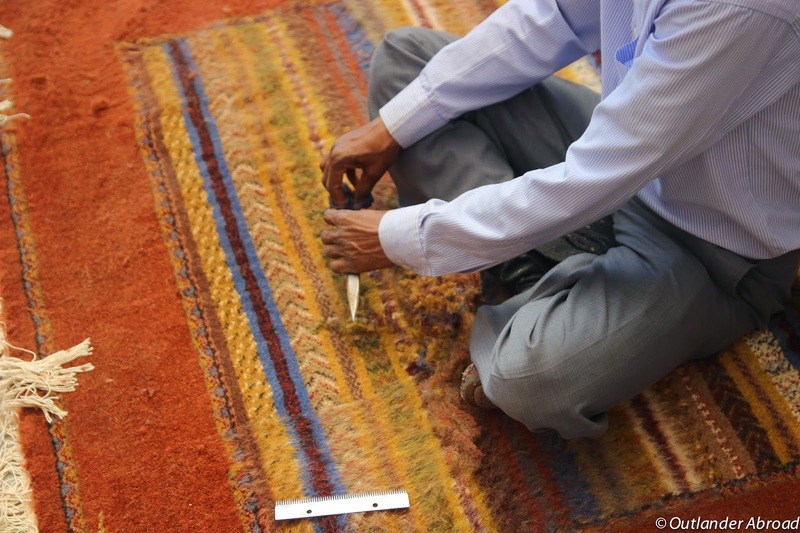 We were given a demonstration in the block printing and rug making process before being given an elaborate sales pitch for the rugs themselves. Yes, I bought a rug. 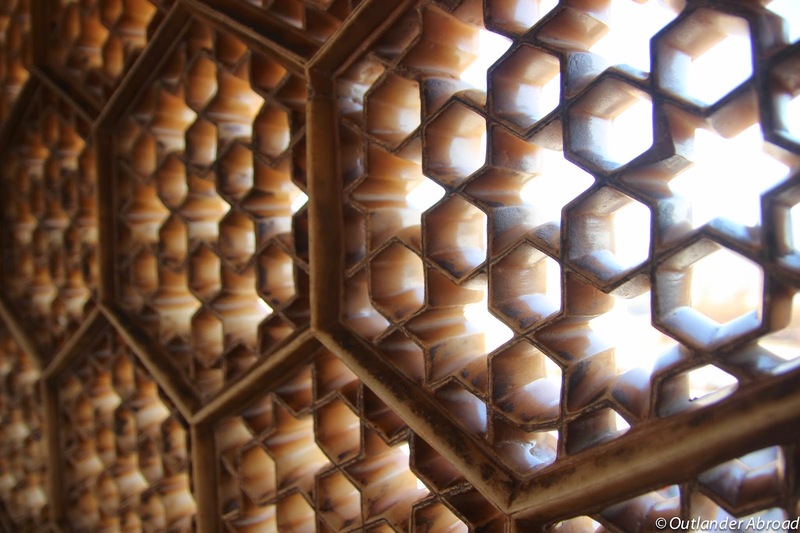 Yes, it is beautiful. 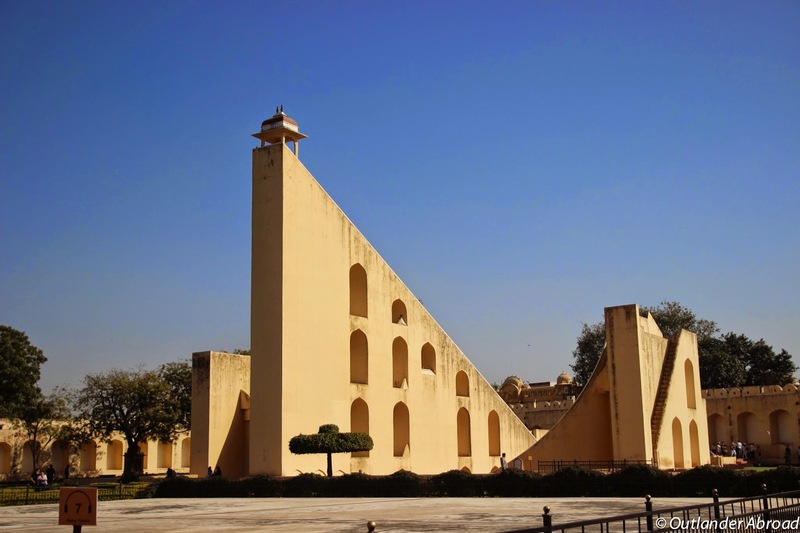 Following a much-needed lunch break, we paid a relatively quick visit to the observatory, an outdoor area with dozens of structures used as sundials and for various other celestial measures. 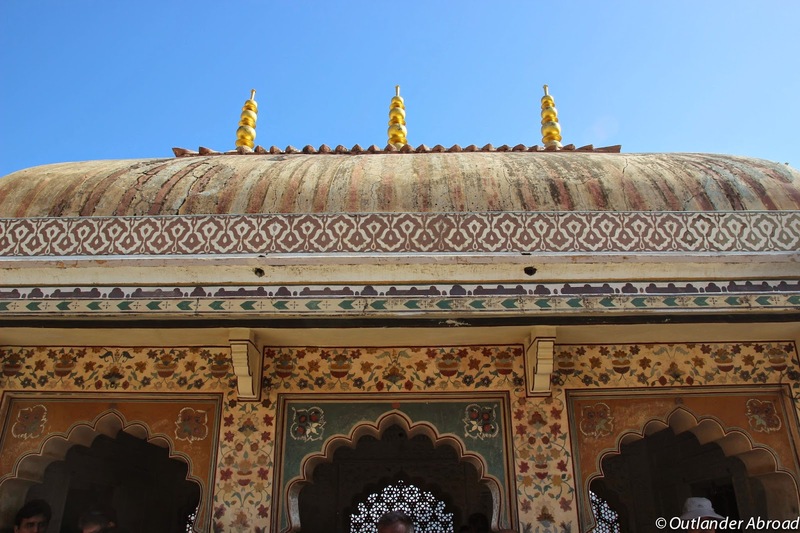 It was brutally hot and packed with tour groups, so we didn't stay long, but we did learn a bit about the importance of astrology in Indian life: marriage dates are carefully chosen based on the positions of the celestial bodies and the birth dates of the marriage candidates. 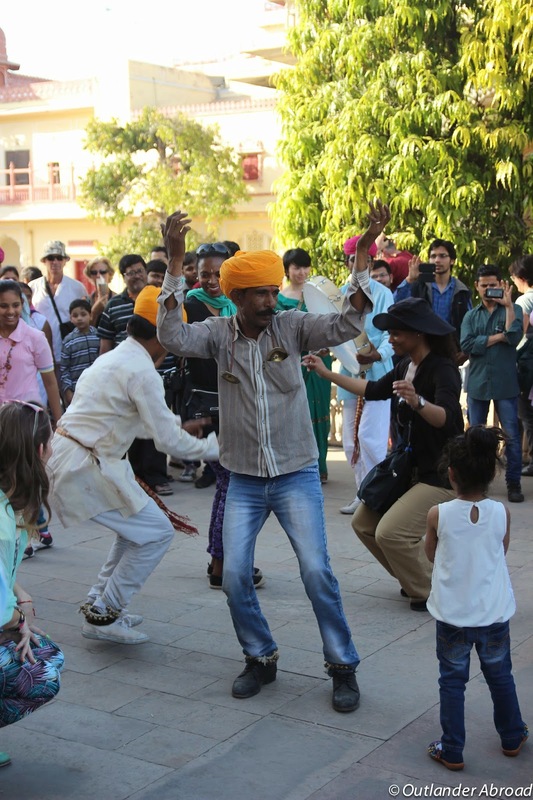 A visit to the nearby City Palace included an exhibit of royal clothing, a film set for a Bollywood Music video, and a group of men in brightly colored yellow turbans dancing and playing music outside, pulling in members of the crowd to join in the celebration. 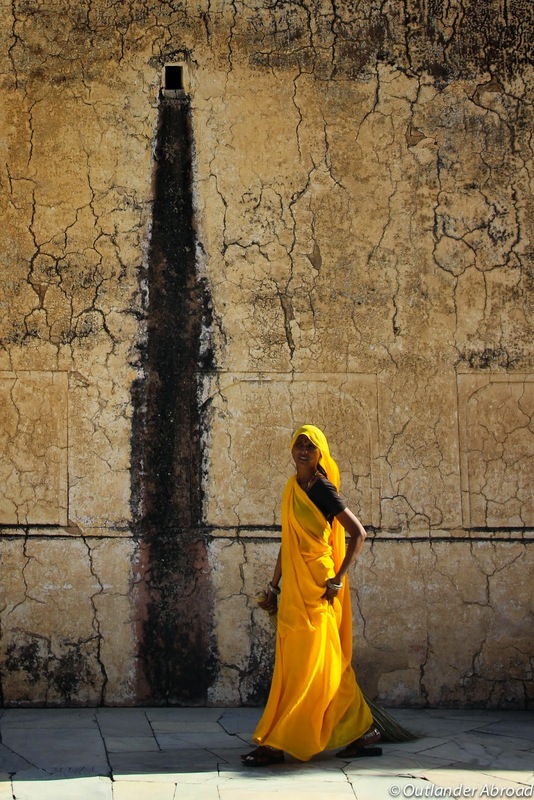 As we drove through the streets of Jaipur nearing sunset, we noticed elaborate set-ups of wood, covered with strings of cow dung and flowers, being carefully tended to by women in brightly colored saris. 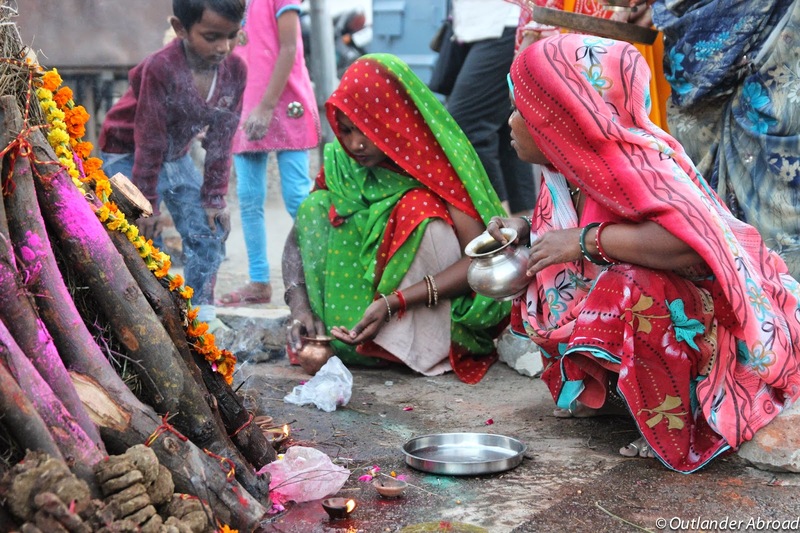 These were actually pyres being prepared to celebrate the start of Holi, and as soon as the sun set, we could see the fires being lit and smell the smoke filling the air. 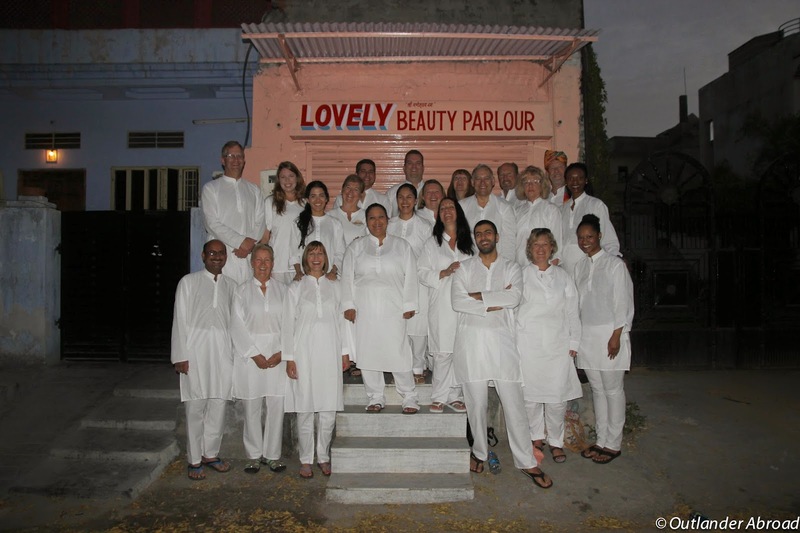 We awoke before dawn, dressing all in white to begin our journey to Pushkar, where we would actually be celebrating the Holi Festival. We stayed at the Majestic Palace Hotel, which had a beautiful interior garden, a tasty vegetarian restaurant, and even a pool, and we were given beautiful strands of flowers upon arriving. 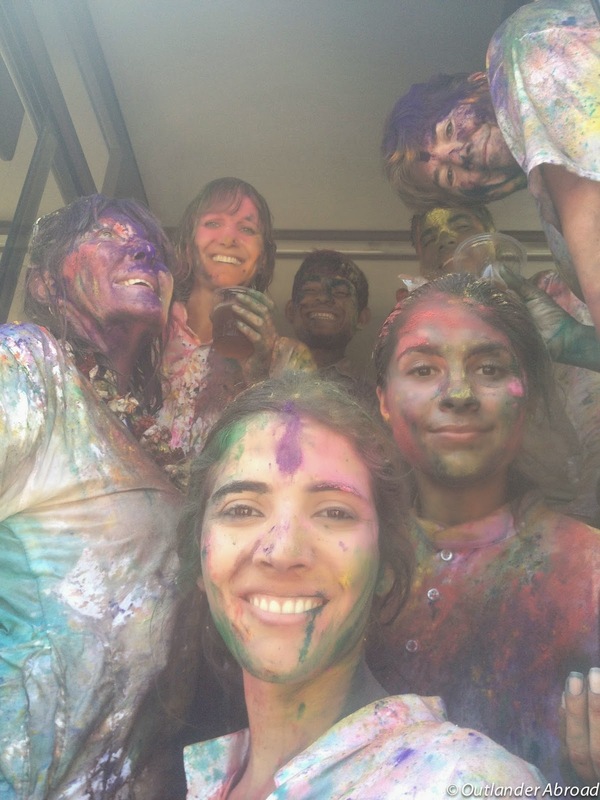 Our tour organizers had set up a very safe, sheltered Holi experience for us, bringing in some local performers, piles of colored dust, and buckets of water for the five groups to celebrate with. 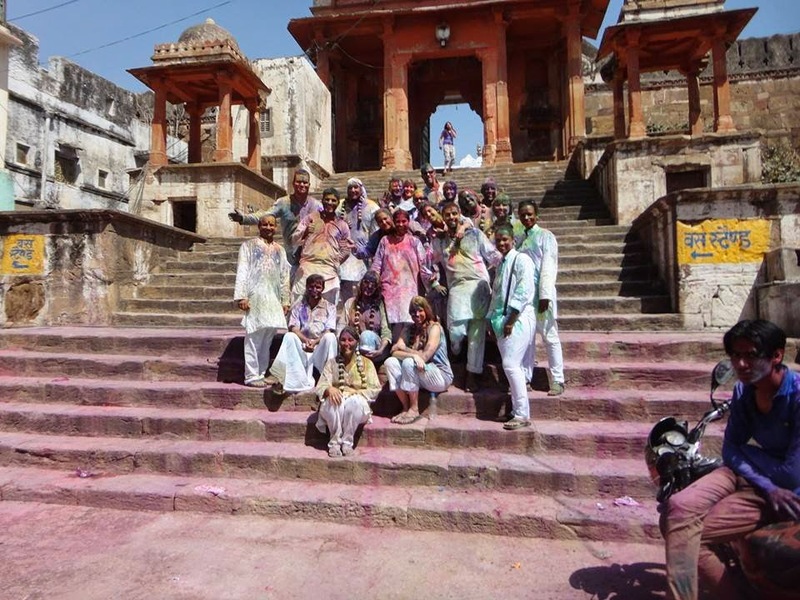 While we had a great time "playing at Holi" with our fellow tour group members, we weren't satisfied to have the segregated experience, and our group made the long walk into the center of town to see the real thing in action. The first thing I noticed was that all the local women and children were safely in or just outside their homes - from a local perspective, this was a male-only celebration. 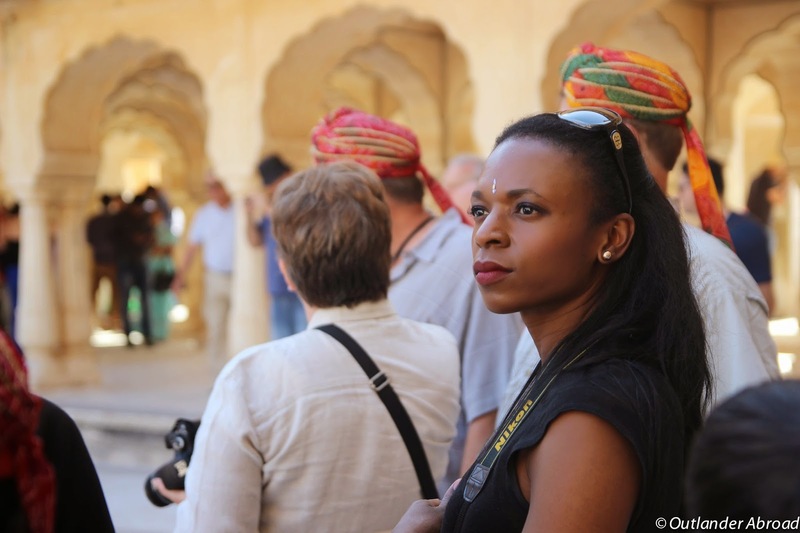 The only women walking around were westerners. 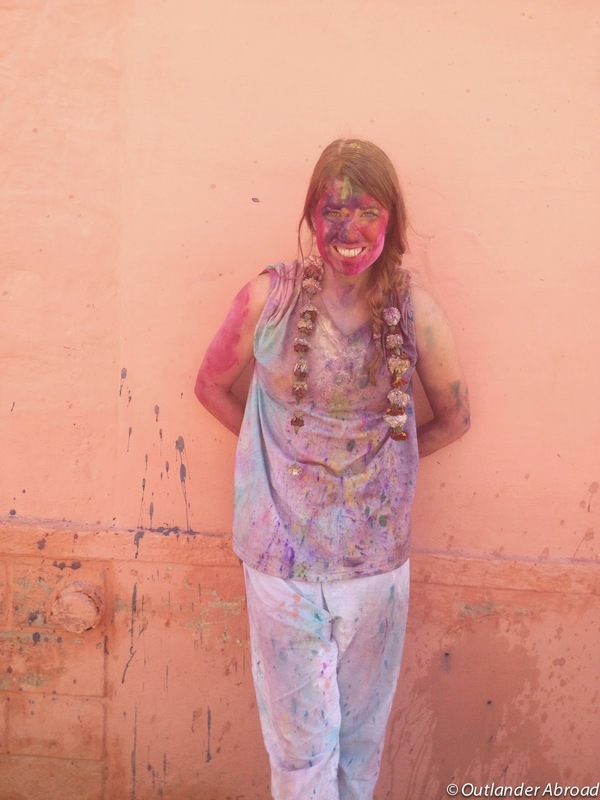 So this is my disclaimer: I would definitely not recommend participating in Holi in India as a solo female. 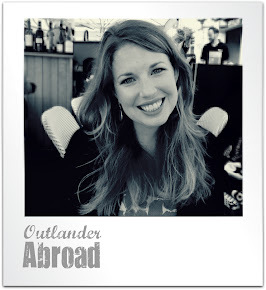 Be absolutely certain that you have at least a small group and at least some men with you. 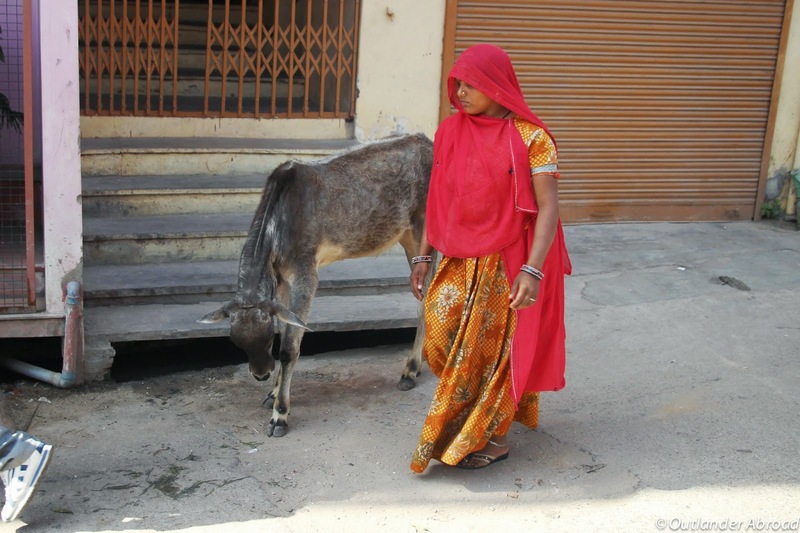 We did unfortunately see one young woman who was by herself who had been molested by a crowd of men. Luckily she didn't appear to have been physically hurt, but it was a sobering reality of the festival going on around us. 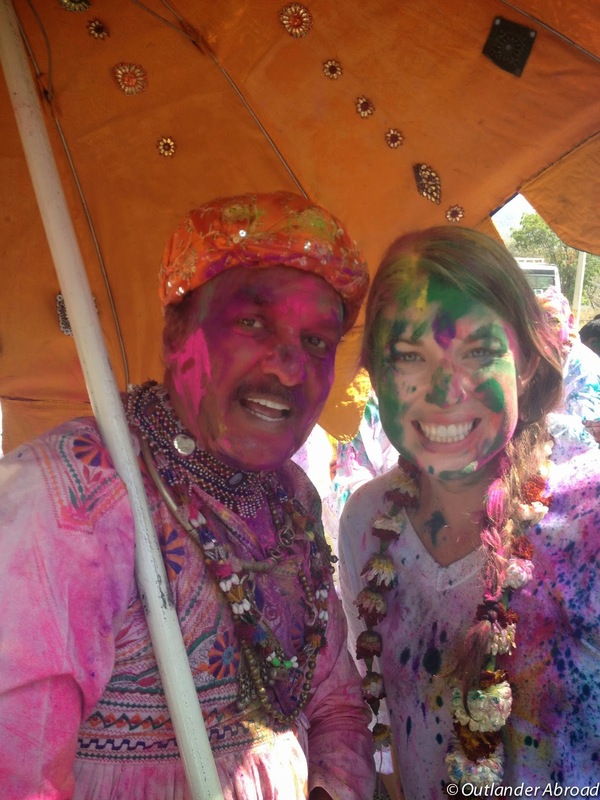 However, as a whole, it was fascinating to see the "real" Holi experience happening around us. Surprisingly, the main celebration - happening inside a central square - seemed much more like a rage than anything. 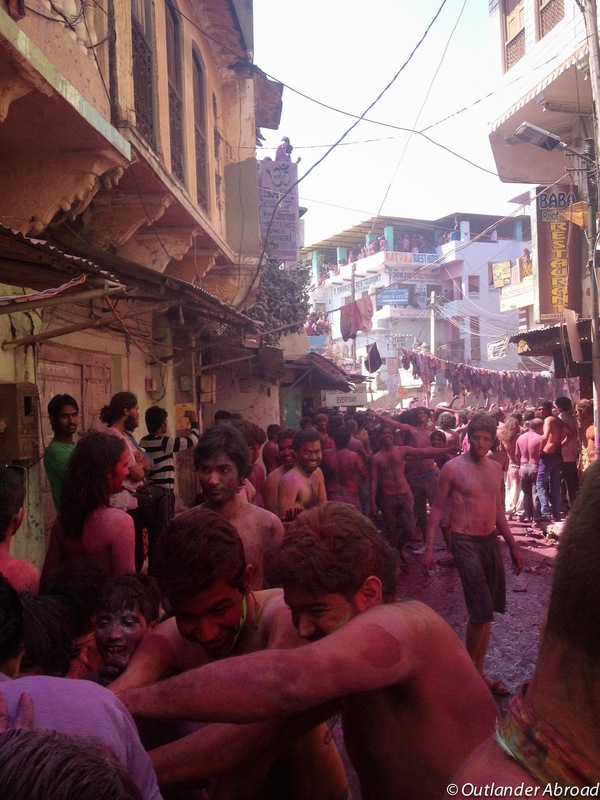 Everyone was covered in bright pink and purple paint, jumping and dancing in a mass to blasting house music. Any men that entered the crowd had their shirts ripped off immediately (thankfully they didn't touch the women), the remnants of fabric tossed onto overhanging power lines. 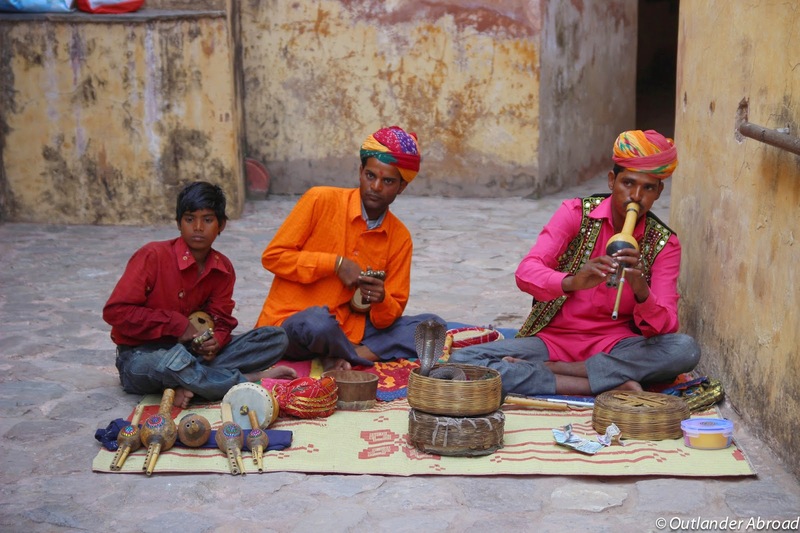 We wove through the crowd briefly, just to see it, then sat down nearby to have cups of chai, watching the celebration before heading back to rest and get cleaned up. 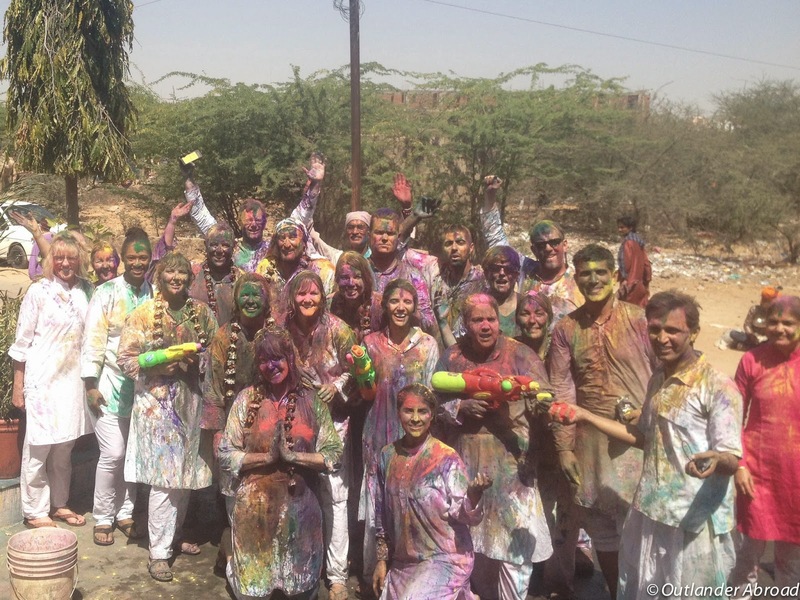 Another note: make sure to cover your body and hair in coconut oil before participating in Holi. 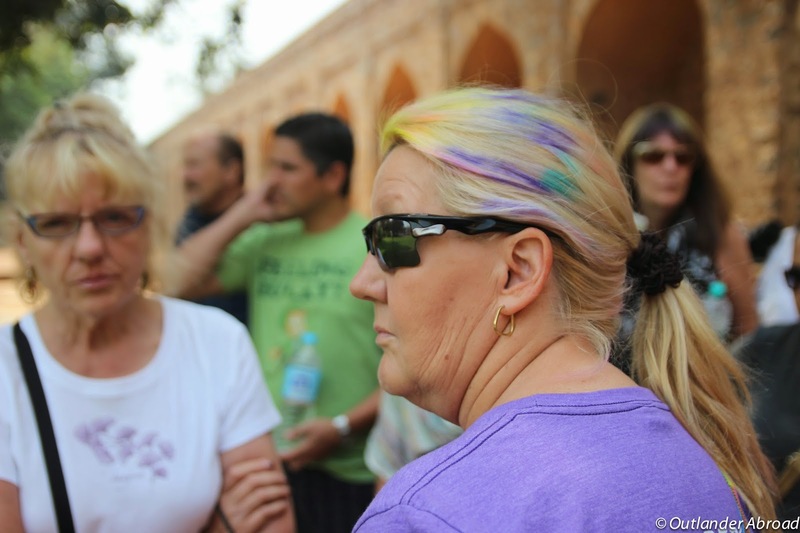 We weren't ever given the warning, and many members of our tour group (particularly the women who already color-treated their hair) left India many days later still sporting green and purple hair, and it took me a couple of days and many, many showers to get the dye off my skin!